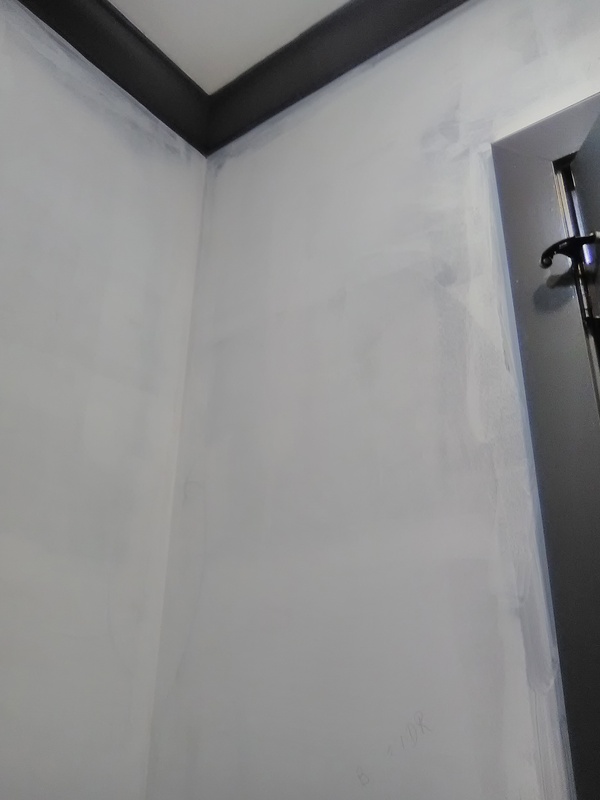 I showed up to hang wallpaper in this powder room in a newly constructed home and found the walls just as I had asked them to be – smooth and with just the barest, thin coat of primer over the new drywall. 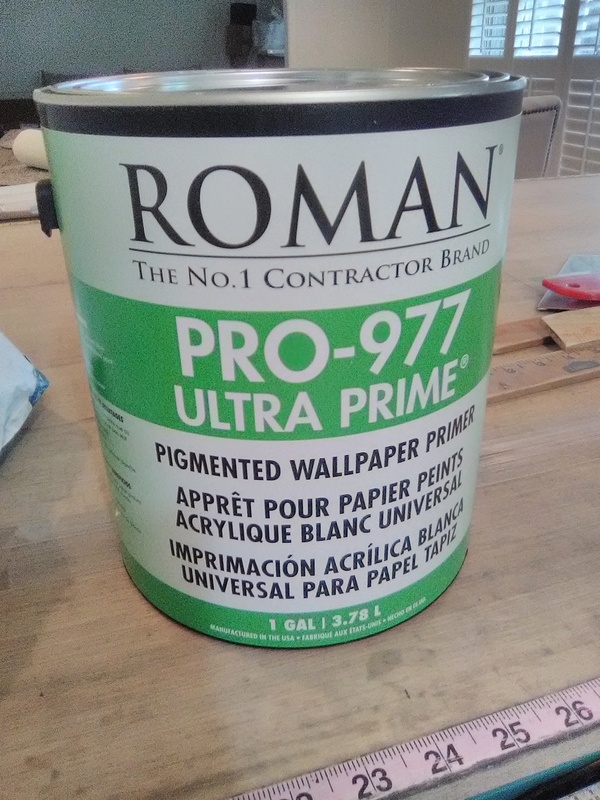 I was getting ready to apply my wallpaper primer… and saw walls covered with the likes of this. 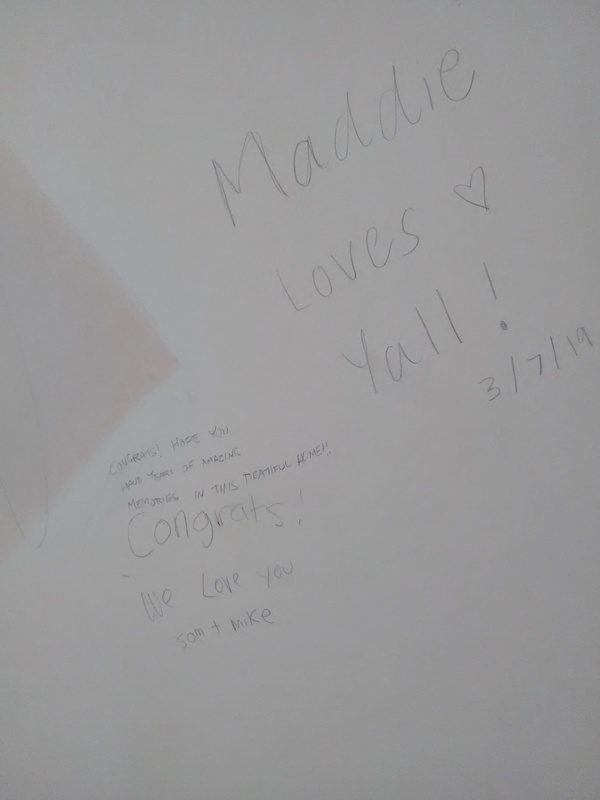 I guess the homeowner had thrown a housewarming / engagement party, and his friends had wished him well by writing their sentiments where they would remain forever – under the wallpaper. This is not the first time I’ve seen this, and, really, its a sweet idea – to have loving and encouraging thoughts from special people in your home forever. 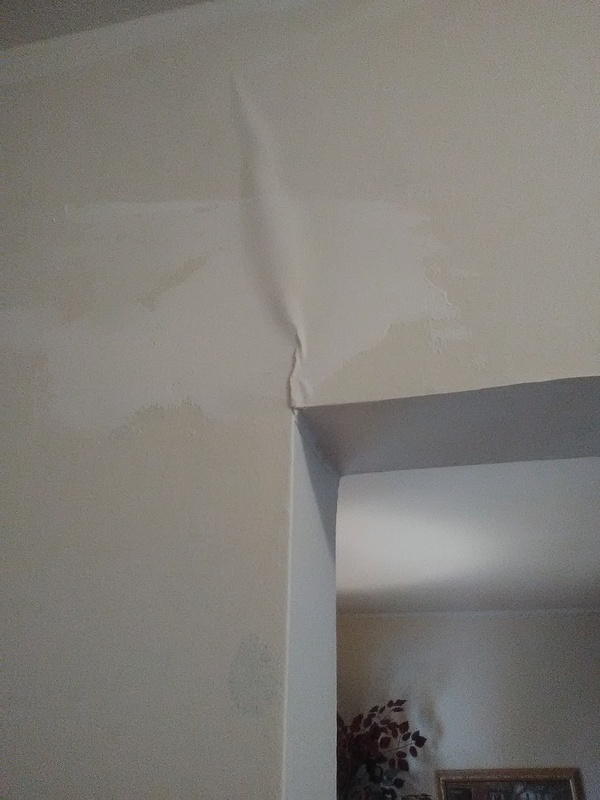 This home experienced a water leak, and the bottom 2′ of drywall had to be cut out and replaced. 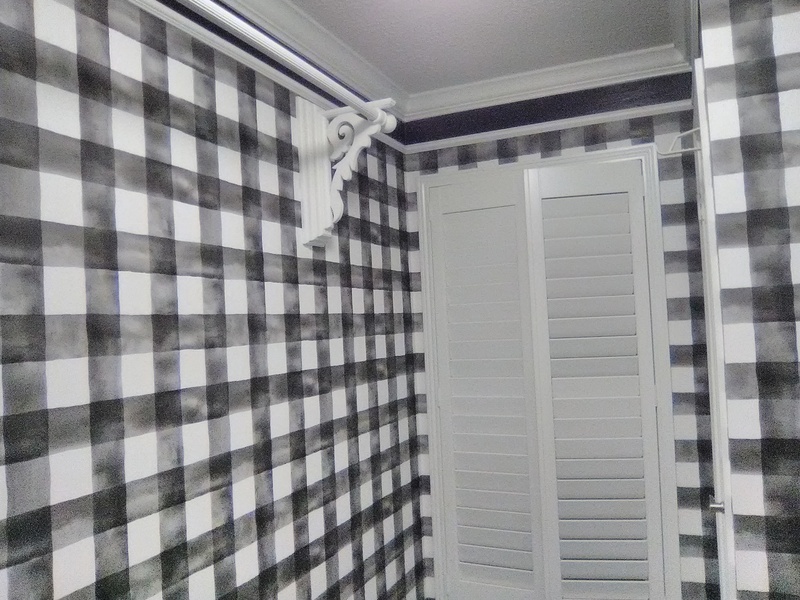 When taping-and-floating in the new drywall, the contractor didn’t bother to remove the existing wallpaper, but put his smoothing compound right over it. 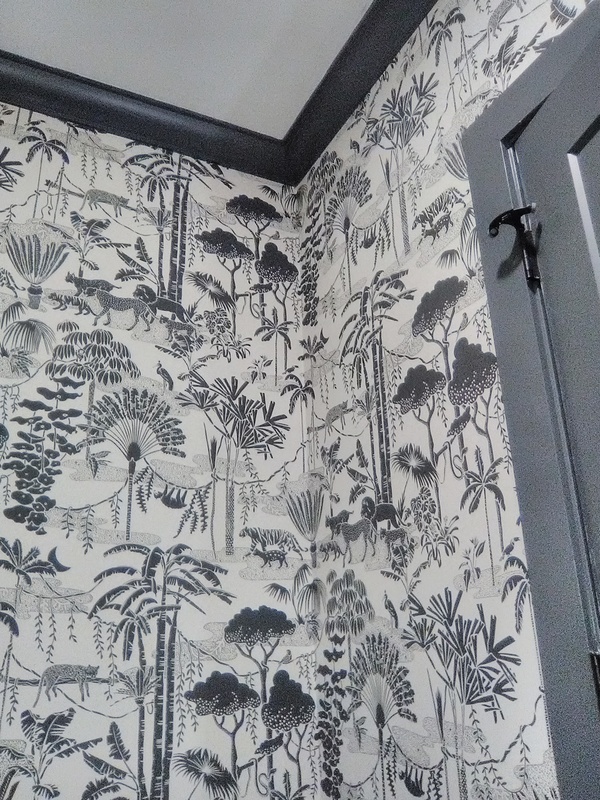 This is bad enough if the old paper is paper, but this wallpaper is vinyl – something you really don’t want buried under layers of joint compound and new wallpaper. Vinyl is shiny, and few materials will stick well to it over a period of time. It is also thick, and that increases the likelihood that seams will pop up, even if they are buried under this “mud,” as we call it. So I took a razor and cut above the contractor’s patch. Then I stripped off all the wallpaper above the patch. 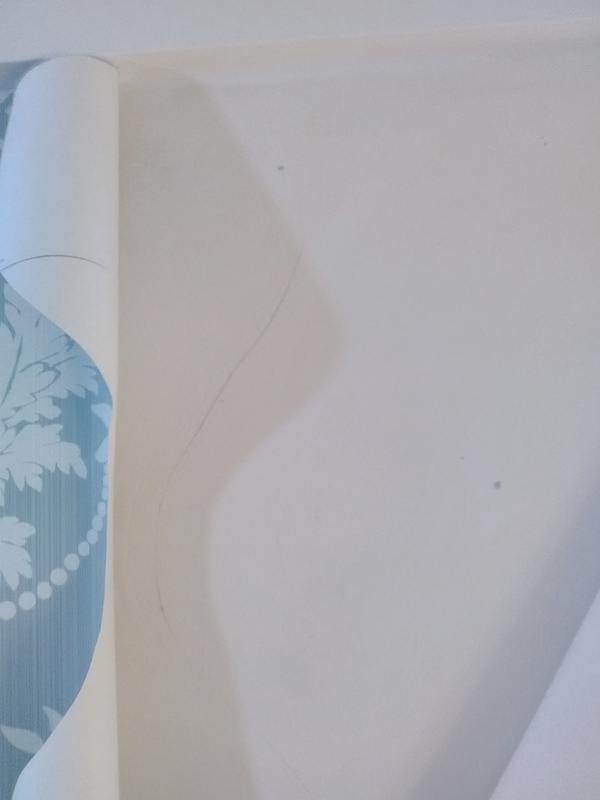 This left a difference in height between the patched area and the newly-stripped area, which would create a visible ridge under the new wallpaper. 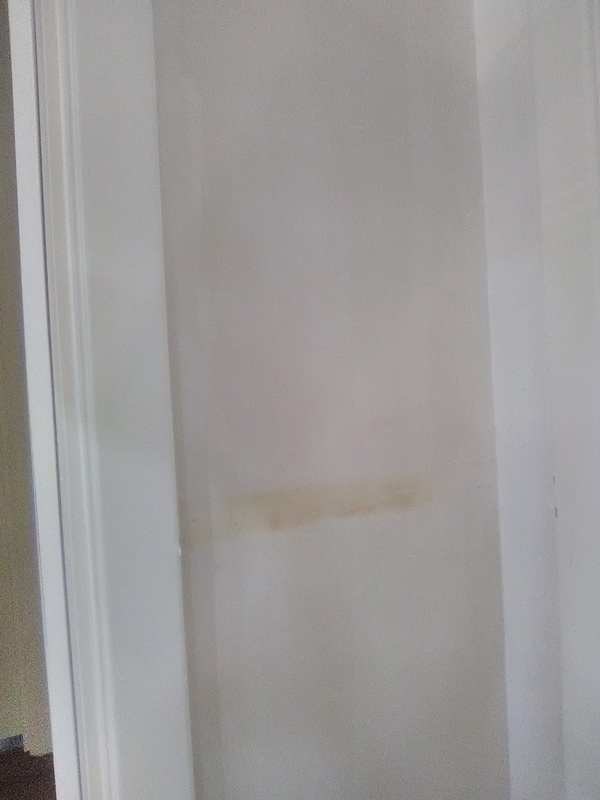 So then I took my own smoothing compound (joint compound) and floated over his patch and the now-bare wall, to eliminate any uneven areas. 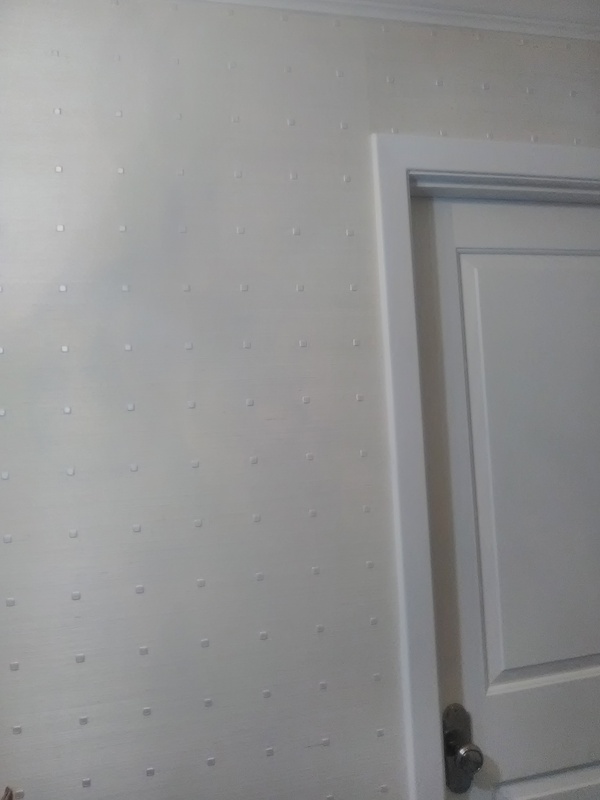 Waited for it to dry, sanded smooth, removed dust, primed with Gardz, and finally was able to hang the new wallpaper. 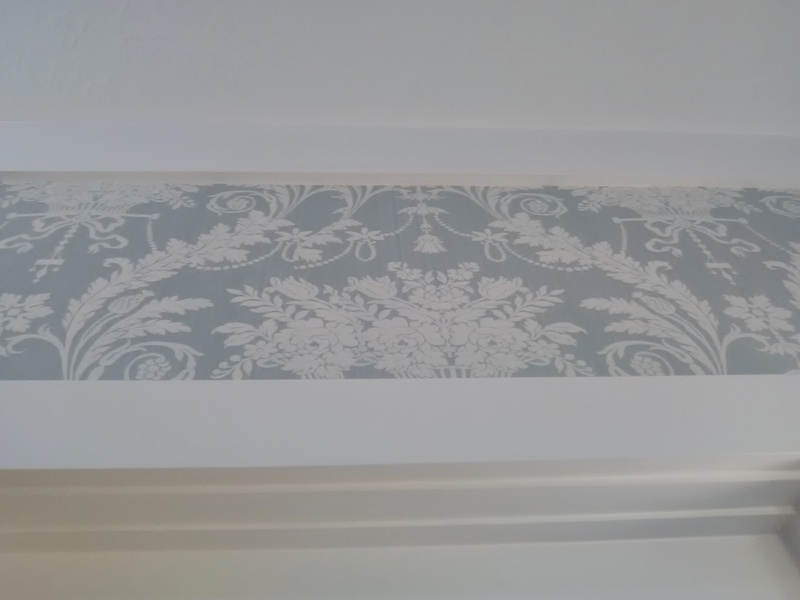 This took a LOT more time than I originally planned for this job, but it was worth it to keep vinyl wallpaper from being underneath the new paper, and to prevent any bumps or irregularities from showing under the new paper. 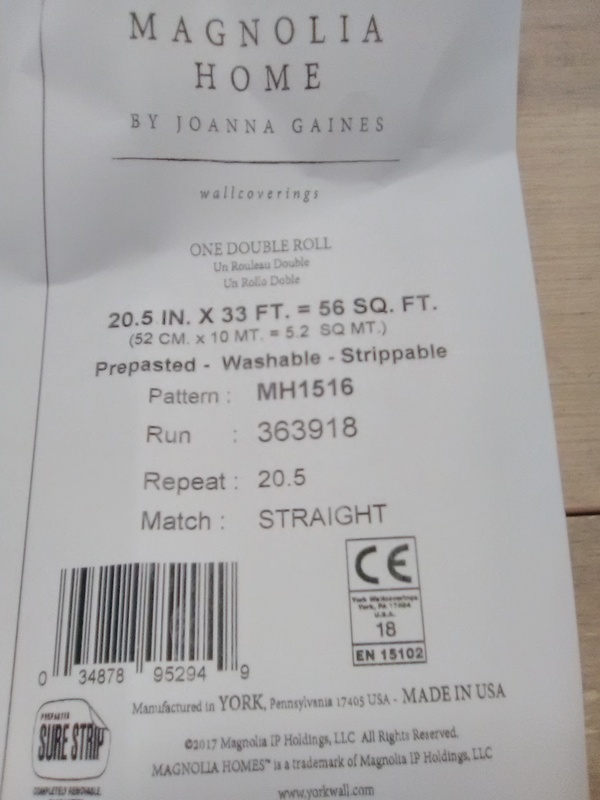 I hung this same paper in this same under-the-stairs powder room in a Galleria-area townhome (Houston) in April 2014. 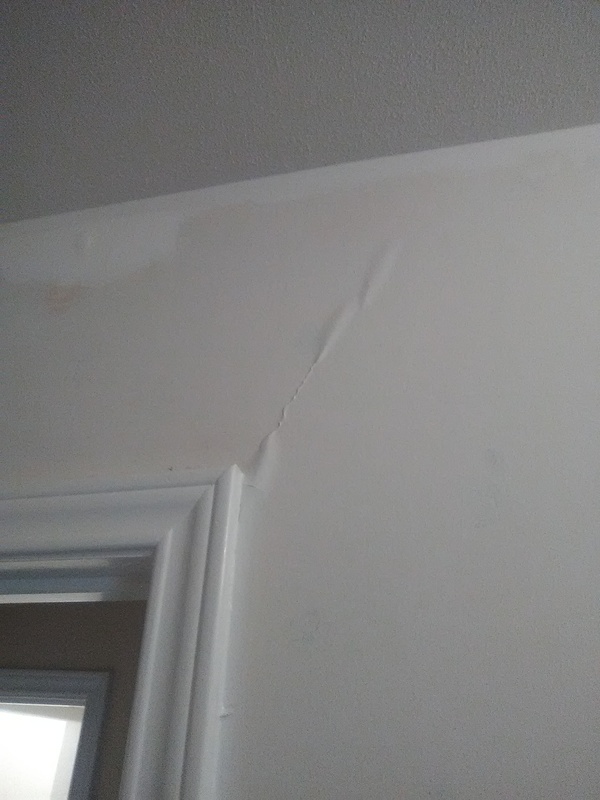 A few months ago, the toilet seal sprang a leak, and water ruined the floors, drywall, and wallpaper. 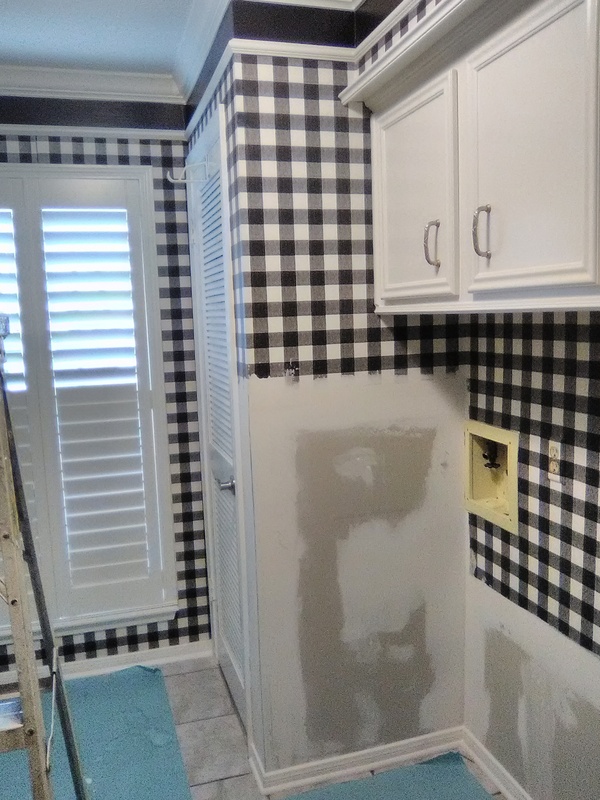 We were able to save the wallpaper on two walls, but the drywall in the remaining three walls had to be cut out and replaced. So the wallpaper on those walls had to be replaced, too. 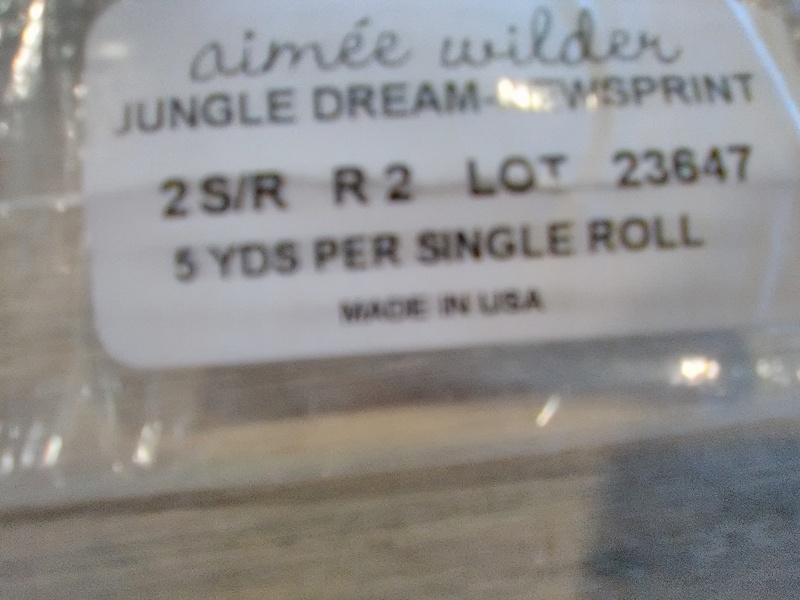 Here are a few pics of how the new paper looks. 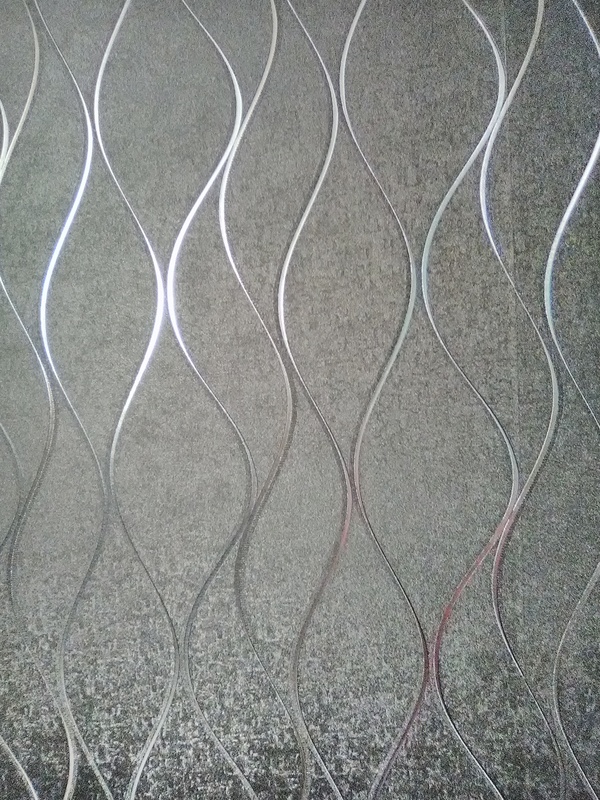 I would call this design fluid, swoopy, and looking like flames, in a silver metallic finish. 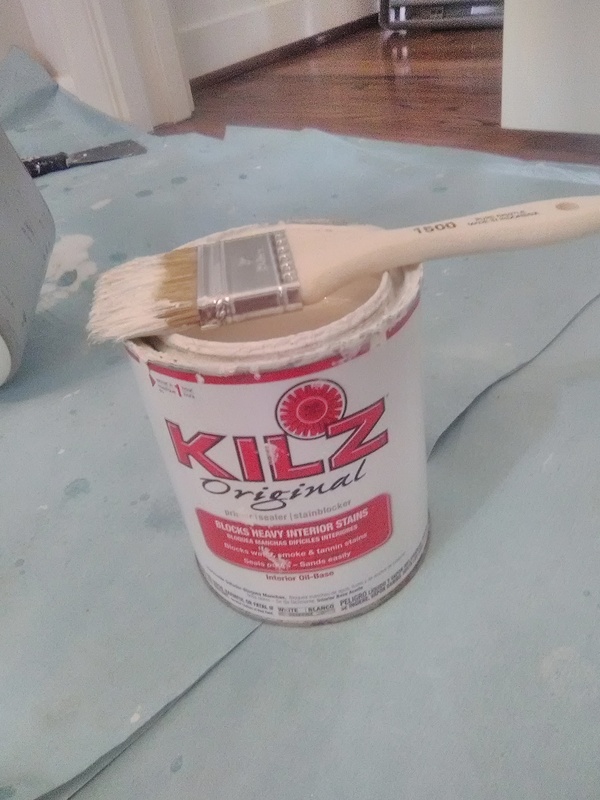 The manufacturer is York, and it was bought from my favorite source for good quality, product knowledge, expert service, and competitive price – Dorota Hartwig at Southwestern Paint on Bissonnet near Kirby. (713) 520-6262 or dorotasouthwestern@hotmail.com. She is great at helping you find just the perfect paper! Discuss your project and make an appointment before heading over to see her. This home in the Briarpark neighborhood of West Houston was damaged in the flood from Hurricane Harvey. During the rebuild, the young homeowners did a major update, and now you would never guess the house dates to the ’70’s. The powder room wasn’t very groovy, though. It had high ceilings and bare drywall walls. The woodwork was painted a chocolate brown, and the vanity was a muddy charcoal grey. The room was just screaming for some personality. 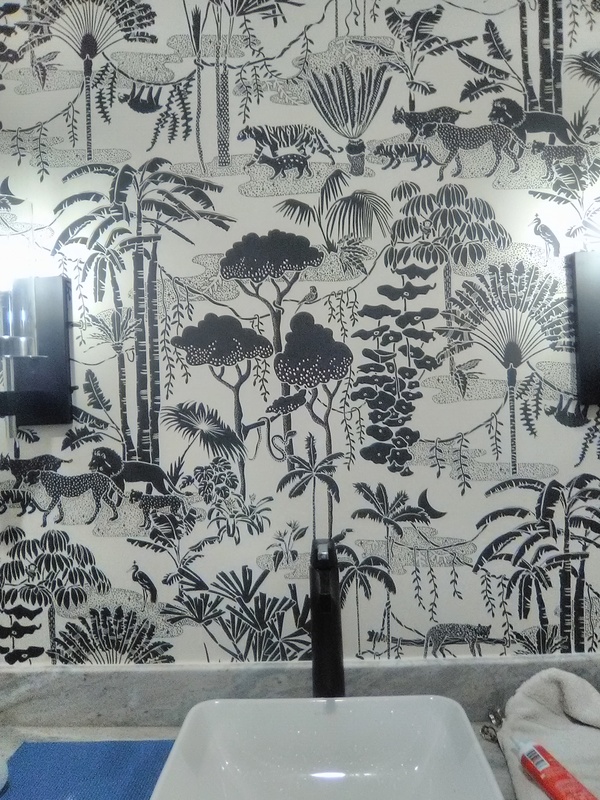 This “Jungle Dream” pattern by Aimée Wilder fills those tall walls perfectly. 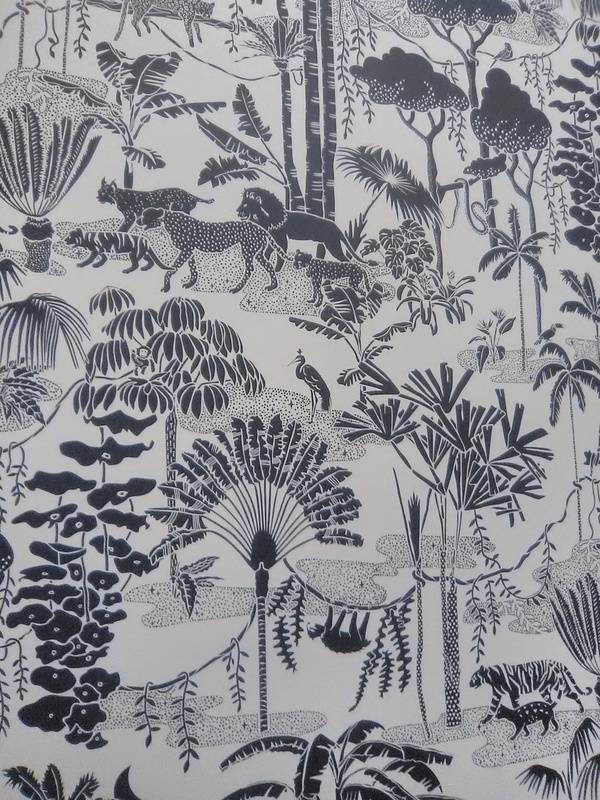 It’s a really cute pattern with a lot of animals and plants – the more you look, the more you discover. 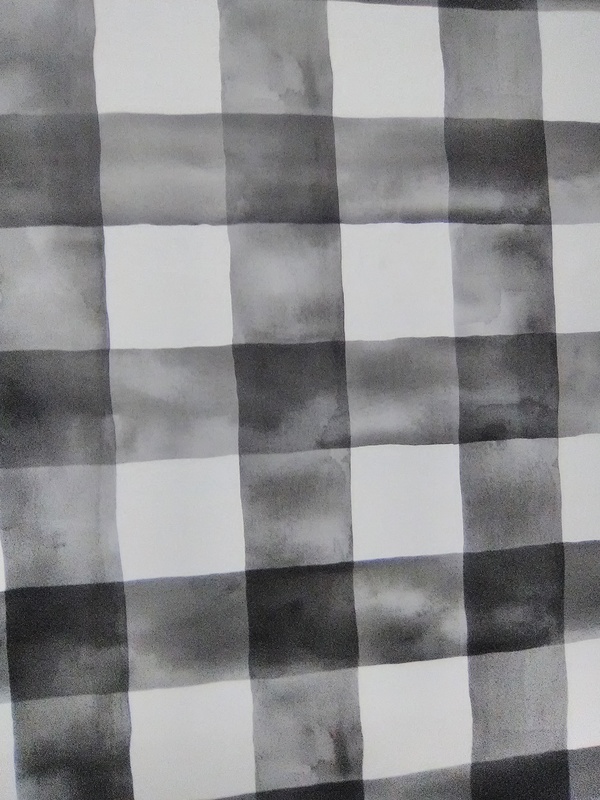 The super-long 44″ pattern repeat eats up (and wastes) a lot of paper, but it ensures that you don’t keep seeing the same design element over and over. The dark brown ink on a light tan background coordinates beautifully with the paint on the room’s trim. 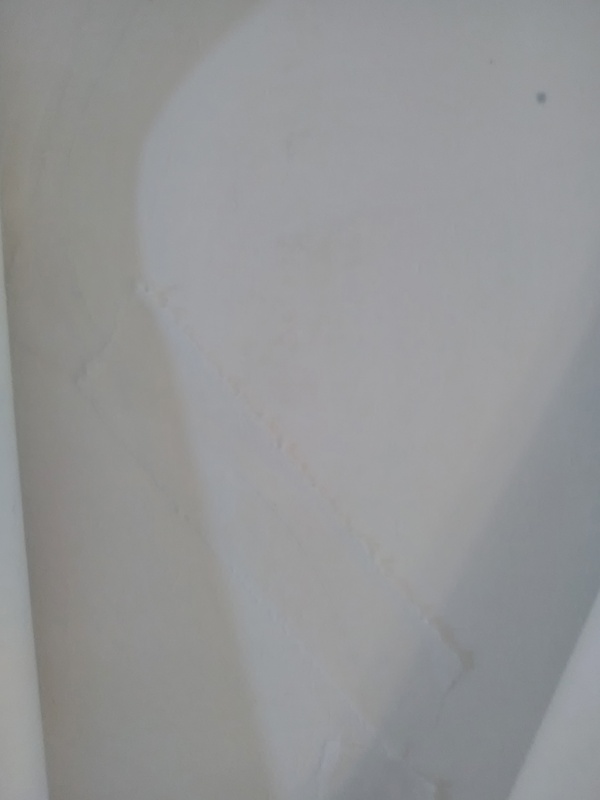 Here are pictures of cracks and wrinkles in the drywall, and also in the wallpaper over the drywall. These are caused by the foundation of the home shifting, which is pretty common in Houston, and particularly in this Meyerland neighborhood. 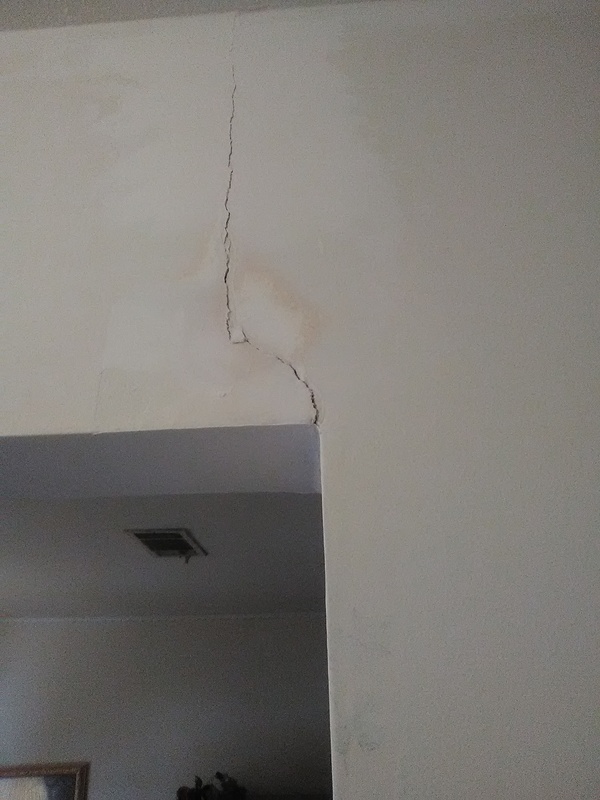 Rain, and the lack of rain, as well as other factors, cause the ground to swell or shrink, and that causes the home’s foundation to move – and that causes cracks like these to appear. As weather conditions (and the conditions within the ground) change, the cracks can close up again. 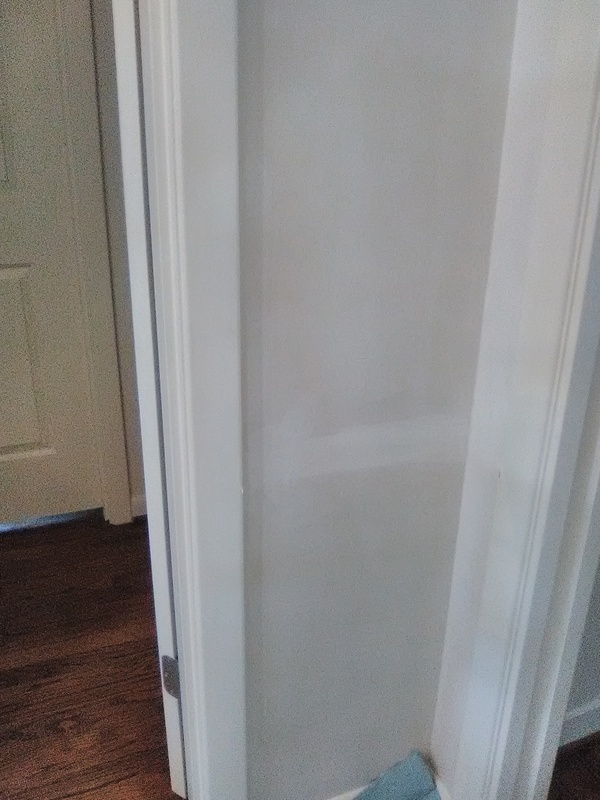 I used a Stanley knife to cut out the bulged areas, and then placed mesh drywall tape over the cracks, followed by joint compound, which I sanded smooth and primed, before hanging the wallpaper. The mesh tape is supposed to flex a little, and will hopefully absorb some of the strain the next time the house shifts, so, with a little luck, the cracks will not reappear. 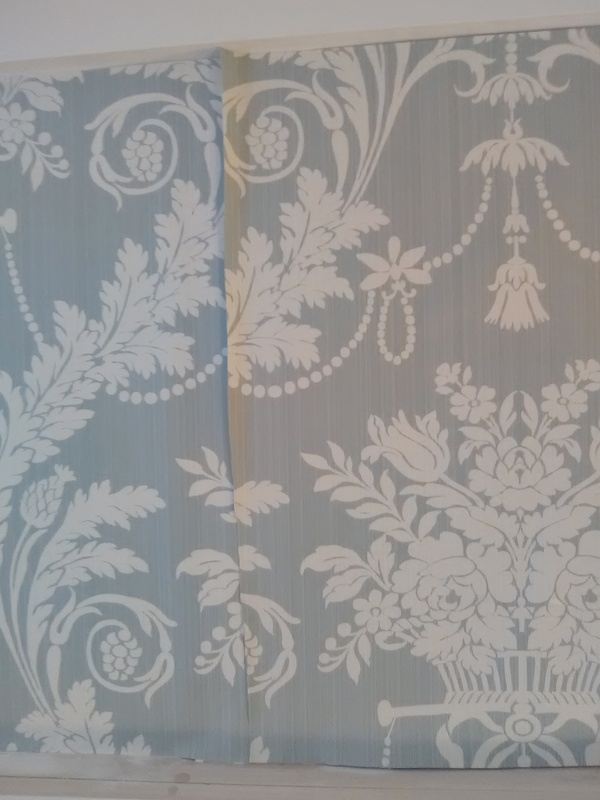 I have just stripped off a solid vinyl wallcovering that had been up for at least 10 years, possibly twice that. The entire wall was covered with mildew. 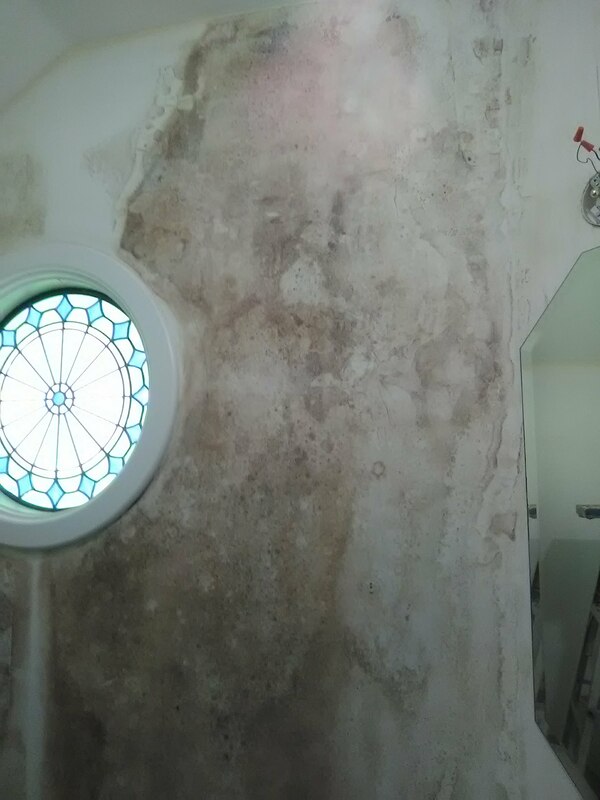 The mildew was present just on the exterior wall; not any of the walls that connected to interior areas of the home. Mildew breeds when there is moisture. This indicates that there may be a leak in the home’s siding, or a leak in a window on an upper floor allowing water to get inside the wall and into the drywall. 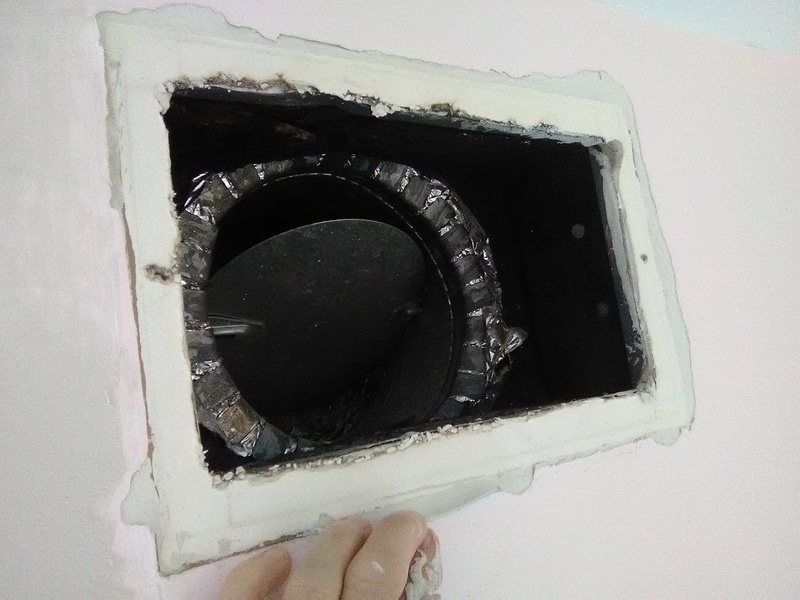 Another possibility is that plumbing inside the wall could have sprung a leak, and also caused the drywall to become wet. 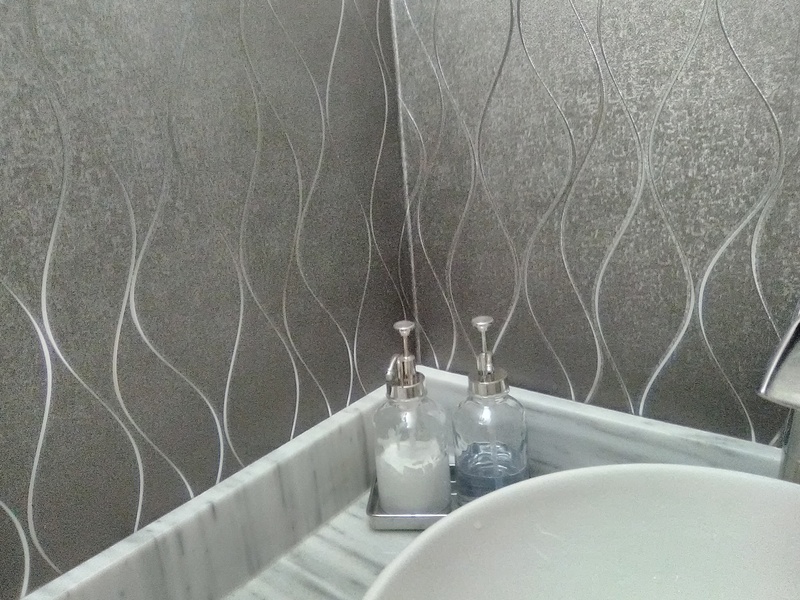 Because the wallcovering was solid vinyl, it trapped the moisture between the wall and the wallpaper, and that allowed mildew to grow between the two surfaces. I’m rather surprised that the mildew didn’t penetrate through the wallpaper and show on the surface. The drywall didn’t appear to be soggy or rotted or compromised. 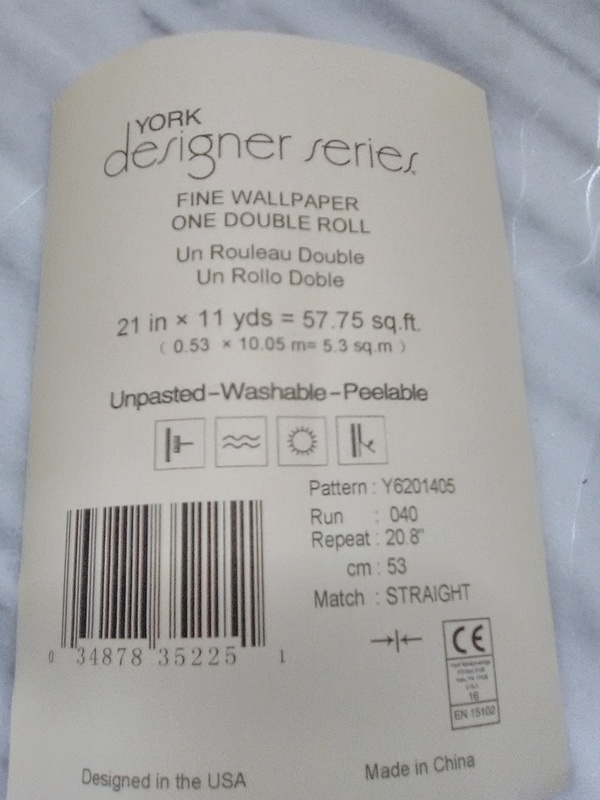 Another reason why I don’t like solid vinyl wallpapers.